We have had many of our customers asking us why oil prices are so high despite it being the summer months, and whether we know if they will be coming down. Whilst we have had some fantastic weather over the last few weeks, the oil market has had some major disruptions. A graph to show the noticeable rise in oil prices over the last 2 years. 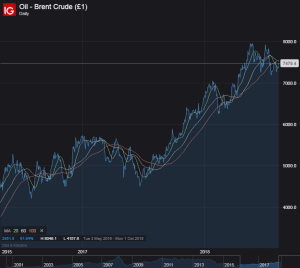 In one year, we have seen crude oil inventories go from an oversupply to being under a huge amount of pressure due to various geopolitical factors. Following the Executive Orders signed by President Trump yesterday, Iran sanctions are now officially starting to come into force. These sanctions could block more than 1 million barrels a day of Iran's crude exports - further constraining supply. Additionally, Saudi Arabia's exports have unexpectedly dropped between June and July causing even more concern for the rest of the year. This has prompted a spike in prices today, however only a week ago prices had dropped assuming that Saudi was going to continue to produce. Stewart Glickman, an energy equity analyst in New York says "If the argument now is that maybe they can't produce as much as everyone was hoping for, that puts some upward pressure on prices." Markets can be highly volatile in the short term, even one tweet from President Trump can have a huge effect on where prices go - unfortunately even the experts can't predict that one! So, even in the hotter months whilst we are not using so much for our individual homes - there is still a remarkable amount of activity on a global scale affecting the cost of oil to us all.